Watercolor paper - Brand on the picture above I use on most of my projects. I love the quality, thickness and also the price is awesome. Blending tool from Rangers - To use with ink pads. 2 pieces of cardboard - size depending on how long you want the journal to be. Now when you have all your tools and materials we can start making pages. To make these can be so much fun. You just play with your paints and inks. There is thousands of different ways to use the materials and there are no rules and no right or wrongs! These are my pages. Some are made only with ink pads with help of a blending tool to blend colors together nicely and then layered over with stencils using same blending tool as well. Other pages have an acrylic paint background and are again layered over with stencils and inks. On few background pages, I also used spray inks. I love using these because they blend colors together almost all by itself after you apply some water over the ink. When I had my pages done, I cut all the pages in half, but you can skip this step if you have enough pages. Then I eliminated the ones I liked a little less and used them to apply large stamps over the top and then cut out the image and glue it to a nicer page I had made. Some pages I didn't even used stamps and just cut out some petals and circles and then glue it into the desired shapes (in my case - flowers) and then drew over it with a sharpie pen to define the flower properly. For the cover of the journal, I picked a black stripy paper from Heidi Swapp. Its very pretty and a little glittery too. You will also need another patterned paper for the inside of the journal. That one will be cut into exactly same size as the cardboard paper is and will be glued by mod podge to the cardboard (make sure you put it on the right side of the cardboard. If you cut the corners, it may be a little confusing, but this site of the page goes on the inside of the journal. Now is the time to use your binder tool. I used Zutter tool but there are others on the market that you could use. Sort out all your pages the way you want them to go and then just simply follow instructions of your binding tool to make them into a journal. When I was done I've started decorating the pages inside a little more. I used my sharpies to draw random designs to the page and made a little text around them. I also printed some photos and added them to the pages. 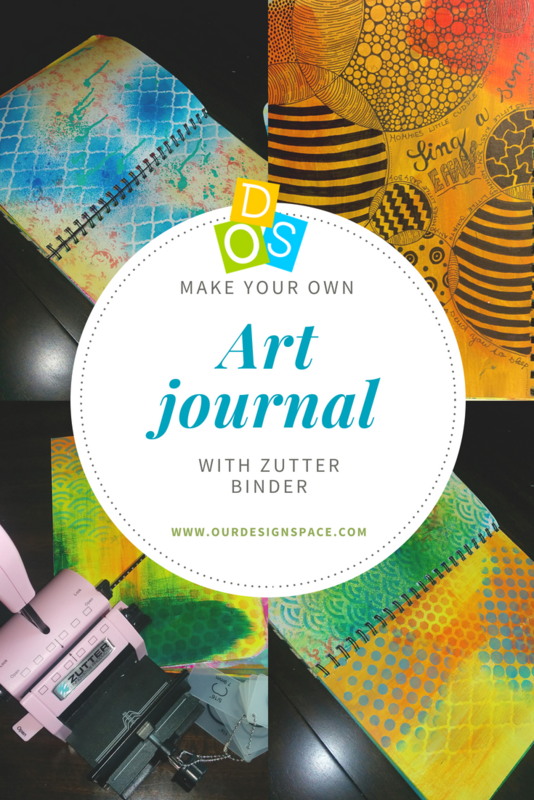 There are endless possibilities of what your journal could look like. Wish you luck and let me know how it went!